Cold stress isn't just a hazard for outdoor workers. What are the best ways to prevent cold stress injuries and illnesses and what is the best clothing to wear in cold environments? 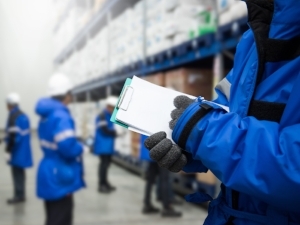 Anyone working in a cold environment may be at risk for cold stress. This could include an indoor workplace like cold storage or an outdoor job in construction or agriculture. Prolonged exposure to cold and/or freezing temperatures while on the job may cause serious health problems such as trench foot, frostbite and hypothermia. In extreme cases, exposure to cold temperatures can lead to death. Dressing properly is extremely important to preventing cold stress. Wear at least three layers of loose fitting clothing. Layers provides better insulation. An inner layer of thermal wear, wool, silk or synthetic (polypropylene) to keep moisture away from the body. A middle layer of wool or synthetic to provide insulation even when wet. An outer wind and rain protection layer that allows some ventilation to prevent overheating. Tight clothing reduces blood circulation and warm blood needs to be circulated to the extremities. Hat that covers the ears. A hat will help keep the whole body warmer and reduce the amount of body heat that escapes from the head. click here to get 10 free safety meeting topics today! Dec 5 Danger, Caution, Warning, Stop!